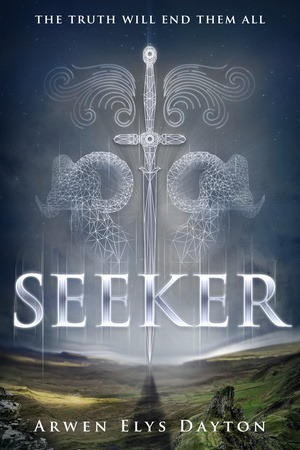 My choice for this month was Seeker, by Arwen Elys Dayton. I had been so excited to get approved for this book on NetGalley. The cover is gorgeous, and the synopsis is so promising! Plus, it was being marketed as the next big thing, the best thing since…whatever the last big thing was. The first chapter jumps right in and I was totally on board with everything, until a few things happened. First of all, the relationship between John and Quin is already in full swing, which is fine, but it felt a little forced. Especially once we saw the characters more (I say ‘saw’ NOT ‘got to know them better’ because I feel like we hardly got to know these characters) and I discovered I liked neither of them. Quin is an idiot; I understand that she is in a difficult position, training to be this mysterious Seeker, and then discovering what the Seeker actually is is much darker. That’s another thing: What is a Seeker? In the beginning, Quin believes Seekers are supposed to be like, glorified police? And then they end up being assassins, and Quin and Shinobu (her distant cousin?) are horrified and suddenly hate their parents. It was all SO contrived. Like, Briac and Alistair (their respective fathers) should have just raised them knowing they were going to be assassins. Why would parade around keeping up a good guy charade and then just expect them to go along with it when they discover the truth and take their oath? The conflict was so painfully contrived that was wholly unbelievable. I stopped reading at 130 pages. I didn’t feel like I knew the characters at all, and the conflict was so forced that I didn’t care. Somehow everyone is unlikable. Except maybe Shinobu, but even he wasn’t interesting enough to keep reading. This is a sad moment when a super hyped up book falls very short. It doesn’t happen often, but when it does, it is painful. This entry was posted in 2 Stars, Book Reviews and tagged Boring, Disappointing, Fantasy, NetGalley, Romance, sci-fi.